formula: One film-coated tablet contains 300 mg moclobemide. As with other antidepressants in depressed patients with schizophrenia or schizoaffective psychosis is used, the increase in schizophrenic symptoms Can be seen. In such patients, if possible, treatment should be continued long-acting neuroleptics. In general, special dietary restrictions are not necessary during therapy with moclobemide. Tiramine hypersensitivity may occur in some patients, all patients should be eaten when excessive amounts of foods containing high amounts of tyramine. As it is known antidepressant therapy, patients with suicidal tendencies should be monitored carefully. Hypersensitivity reactions may occur in susceptible individuals. Rash and edema. Theoretical pharmacological approach, MAO inhibitors may cause a hypertensive reaction in patients with pheochromocytoma, thyrotoxicosis and shape. As experience with the use of moclobemide in this population group, caution should be exercised when deciding on the use of moclobemide. 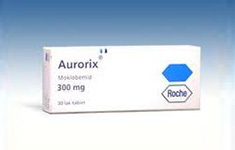 Aurorix the patients, as well as other drugs that enhance serotonin, especially in case of repeated use of combinations of drugs must be careful. This is especially true for clomipramine (see Drug Interactions).